The air was dulcet — in the low 60’s, 50’s when we put it, but with a cloudless sky, it soon warmed to a comfortable paddling temperature. Depending on water level you can continue beyond Nick’s — the right branch after Nick’s has a longer area of navigability than the branch to the left, which, if you want to be Rambo, will eventually lead you to SR 67. The two sections of blooming: the first 2.5 miles to the branch, the branch to the left to Nick’s Road campsite 1.25 miles. These are the dominant white flowers on the lower 2.5 miles. On the upper section, these are already dying and forming seed heads. The pinxster azaleas are in full bloom in the lower sections, mixed with Walter’s viburnum. However, there are still bushes which flowers are still in bud. Expect blooming in this area for another month. Blossoming of Pinxter’s in the upper may be for another 3 weeks, but these are now intermixed with Parsley haw. Both Walter’s Viburnum and Parsley Haw are tall shrubs and if the tide is outgoing, you may not be able to get a close-up. The way to distinguish both are the leaves and the Parsley haw when first blooming have pink stamens, as in the lower photo. Also beginning to bloom are cross vines (not trumpet vines which they resemble), Swamp jessamine (not Carolina which it resembles), bristly buttercup, and beginning to bloom Cowcreek Spider Lily, an endemic species of this area. 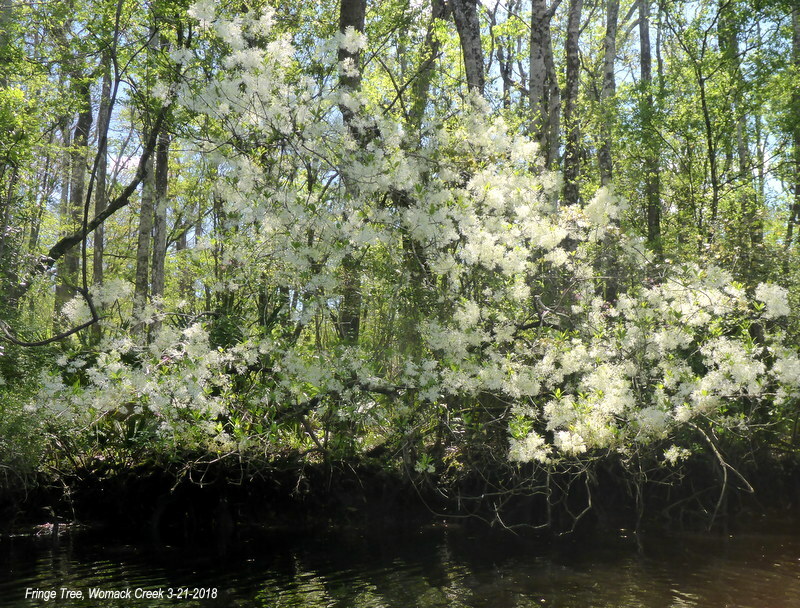 Before reaching Womack Creek, in one of the branches, is a patch of Golden clubs in bloom. 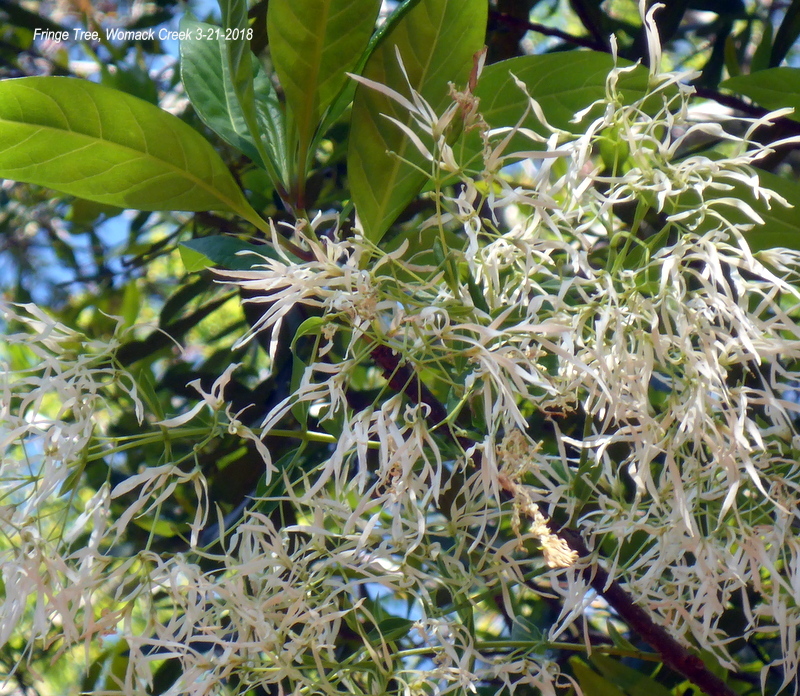 Soon to be blooming are yaupon holly, fringe tree, swamp dogwood. 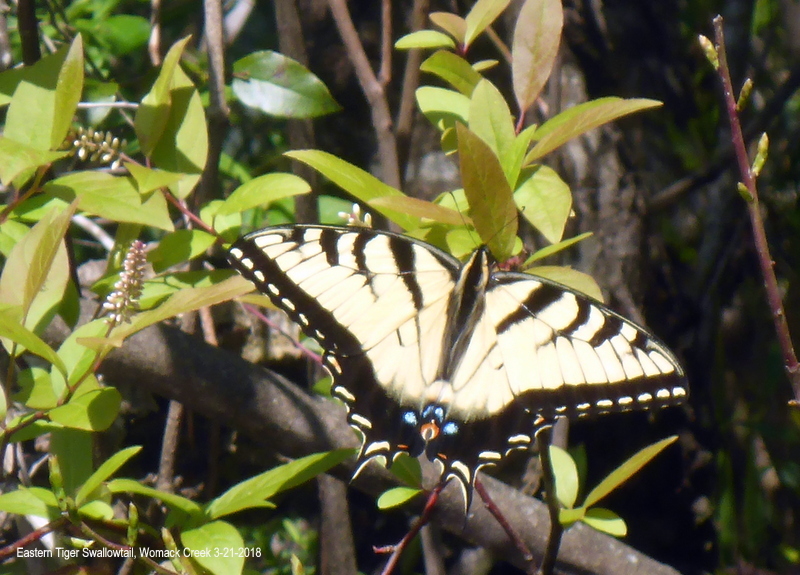 Swallowtail butterflies, monarchs, dragonflies are out. 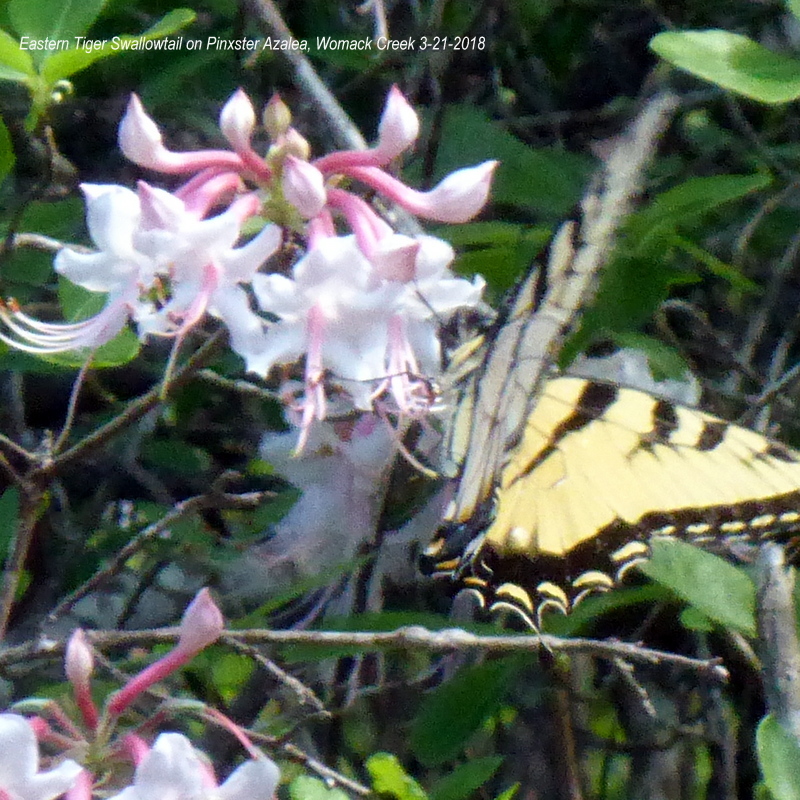 Swallowtails appear with the blooming azaleas. Sweet gums are leafing; slash pines are blooming — clearly spring on Womack Creek. This entry was posted in Native Wildflowers, Tate's Hell State Forest, Womack Creek and tagged Florida native wildflowers, Tate's Hell State Forest, Womack Creek, Womack Creek paddling on March 4, 2018 by marylynanded.